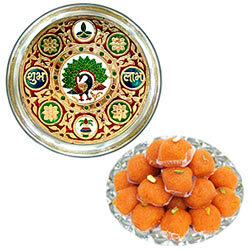 Yummy Laddoos from Haldiram weighing 1 kg will bear sweet Holi messages for the recipients. It is being delivered along with a designer Meenakari sttyled Subh Labh thali having size from 8-9 Inches. This two together makes a wonderful combo.